A curious paradox. 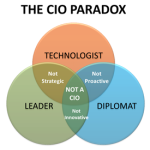 We live in a time when one person can no longer be “all things to all men”, and it is generally necessary to specialise to be proficient and efficient but apparently the CIO must wear many hats to survive. 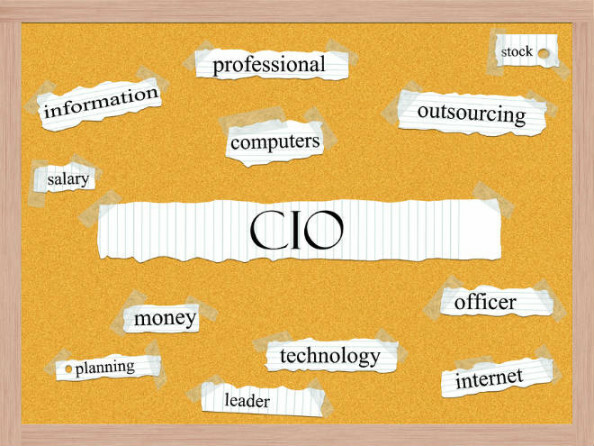 In order for the CIO to continue into the future, what does the “I” stand for? We all know the traditional “information” label, it has been around for a long time becoming popular in the 1990s but back then was it about information or was it mostly about technology. Certainly when the term “information technology” first occurred it was technology first and foremost. In fact when Harold J. Leavitt and Thomas L. Whisler coined the term in a Harvard Business Review article, they said “The new technology does not yet have a single established name. We shall call it information technology”. It involved processing large amounts of data; applying statistics and maths to aid decision-making; and the simulation of higher-order thinking through computer programs. But was it really information or just data processing? Since Enterprise Resource Planning (ERP) arrived in the 1990s, data processing has actually become data analysis and interpretation which does provide information. Information from a variety of sources within an organisation which can be specific to a department or collectively about the organisation as a whole. In this context the title Chief Information Officer is validated. Move forward to the noughties and the economy and business climate has changed yet again. Long held perceptions have had to change, along with job responsibilities and job titles. CIOs are being called upon to play a different role, to reinvent themselves and contribute to business strategy and policy. Information needs to be business intelligence resulting from data mining, efficient analysis and effective reporting. So do we now have a Chief Intelligence Officer? Along with information and intelligence, you can add inspiration as a key contributor in defining strategy. Then there is integration, bringing together disparate applications and creating big data to form a comprehensive picture. Let’s not forget investigation and innovation. All of these “I” tasks can be achieved with an intelligent, innovative and integrated use of the technology at the Chief’s disposal. Whatever the “I” is, it is only a title. It is who the person is and what they are capable of which will determine their role, their survival and yes, their title.